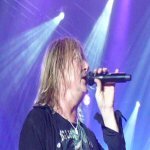 Def Leppard singer Joe Elliott was interviewed on 18th July by Andy Preston of 98.7 Gater FM radio and he talked about 2015 world tour plans. Joe talked about the Summer Tour 2014 with KISS, the second Las Vegas residency, the 2015 studio album/2015 world tour plans, Phil wearing Gene Simmons outfit, playing in a 1983 football match in Hawaii, the opening band Kobra And The Lotus and the charity aspect of the tour. Joe mentioned the 2015 world tour plans and talked about the new studio album recording. "Well when this tour ends. This tour ends in mid September and then we'll take a couple of weeks off to just you know go and see our families and remind them that we exist. Then we're gonna get back on the horse and start finishing this album off. We did a month in February. We did two weeks in May and then we're gonna spend the rest of the year when the tour's done. Most of it, at least recording this album, so we can get it out for Spring time." "And that means if we can do that we'll get back out on the road by about April or so and I think we're gonna head off Down Under first to Australia, Japan. You know maybe some more areas of the Far East, South Africa and then come back up and do Europe and then we'll be back in the States in the summer and then go around the rest of the world after that."